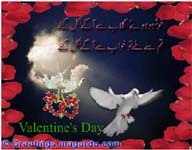 Send valentine cards to wish your valentine warm valentine greetings. Valentine's Day is the perfect time to express your heart's desire and feelings to your soul mate. Send wonderful thoughts to your husband/ sweetheart/boyfriend from our elegant ecards. Roses can speak the unspoken words of your heart. Send our elegant virtual roses from our Roses valentine's day ecards to express your love to him/her. I Love You It's the perfect time to say those three magical words to your sweetheart with this happy valentine's day card. Click and send valentine's day warm wish to all your loved ones to make their day a special one. It's Valentine's Day... with these beautiful ecards wish your family/ sweetheart/ friend on this happy Valentine's Day to make their day extra special. Mother's Day: Grandma she is the bestest and you are the luckiest! On this special day... make her feel on top of the world by saying 'Love You Mom' in a cute 'n special greetings mother day card. Religious message to wish your friends/ colleagues/ loved ones with this hajj wish. Wish your mom/ aunt/ grandma/ friend/ loved ones on Mother's Day with these warm ecards.